It’s a sad story that has to be told. 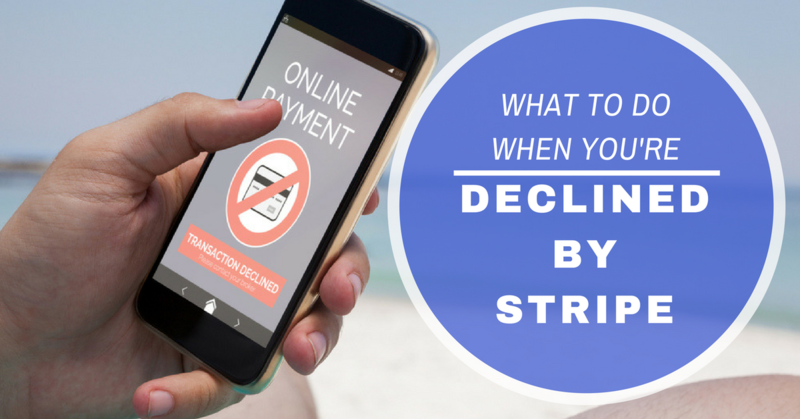 You received the dreaded “declined” email about your request for service, but not before you’d already integrated Stripe into your website and processed hundreds of payment transactions. What’s going on? Why were you declined by Stripe after a few weeks? Starting an account with Stripe was nearly as simple as 1-2-3. Yet, when declined by Stripe after-the-fact, it proved a complete surprise. Perhaps you fell for Stripe’s good marketing, and neglected to read the fine print. Keeping your account operational (and gaining access to hard-earned revenue) isn’t simple at all. Choosing an aggregator like Stripe (or PayPal, Square, Google Checkout, Amazon Payments and others) puts payment acceptance capabilities at risk. Is that what you need and want for your ecommerce business? Just in case you’re tempted by Stripe, stay with us. Let’s look at basics about payment aggregators, discern Stripe in particular, and why high risk merchants should be wary of being declined by Stripe. Payment aggregators (aka merchant aggregators) process debit and credit payment card transactions for thousands — even millions — of merchants. They aggregate all of the transactions into their own merchant account(s). Monies from cleared and settled transactions remain in Stripe’s bank accounts until the funding process, when it’s eventually paid into the merchant’s business bank account. The aggregator business model represents a low entry barrier to payment processing. On the plus side, it allows Stripe to approve accounts straightaway, so you can begin processing payments (and they can collect fees) immediately. You won’t face being declined by Stripe — just yet. That’s the down side, because there’s no due diligence conducted before approval. Stripe doesn’t know anything about you or your business. Not who you are, your credit history, criminal background, what you really sell, how and if you deliver products as claimed. Absolutely Nothing. In other words, aggregators take on a higher risk pool than traditional merchant processors. Their only recourse if they see something “unusual” about your processing, is to freeze your account or hold your money. Another basic reality is that Visa and MasterCard pay close attention to aggregators. Once merchants process more than $100,000 in sales, the business must be moved to an individual, traditional merchant account. Stripe’s pricing touts “Pay as you Go” with no setup, monthly, or hidden fees. At 2.9% + $0.30 per transaction, Stripe’s fee structure matches other aggregators like PayPal. Stripe charges an additional 1% for international cards, and another 1% for currency conversion. If software coding doesn’t appear in your bag of tricks, Stripe setup may be more complicated than for other payment options. “Stripe’s support is decent, but…the importance of having live phone support can’t be understated.” And Stripe doesn’t offer it. Frequent, automatic chargebacks (at a fee of $15 per). Stripe takes a fairly cautious approach to accepting online payments, which too often results in account freezes and chargebacks. Their minimal underwriting results in easier account creations, but also greater risk of sudden account holds and terminations. Financial risks (to Stripe) posed by certain businesses. Stripe offers an explanation for their choices to ban certain industries in this article posted on their blog. So, if you’re declined by Stripe the rationale’s at least clear (if you read their website). Not so for all merchants that have experienced account shut down or withheld funds without warning. Search the Web, and you’ll find many stories and negative comments about Stripe. We highlighted the most notorious story often referenced in an earlier post, highlighting why startups might want to avoid Stripe payment processing. If you operate a high risk business, Merchant Maverick and other payment experts suggest you’ll be better off with a traditional merchant account, and a processor that specializes in supporting high risk merchants. To avoid being declined by Stripe — or if it happens to you — take the next step to get your payments processing up and running again smoothly and seamlessly. Reach out to MerchACT. We’re a specialized high-risk payment processor with proven account experience. We offer a secure, seamless, end-to-end processing solution. MerchACT helps you land the merchant account(s) you need, and will ensure that a secure payment gateway is up and running quickly. So you can start accepting credit card sales again. And we’ll stick around to make sure that not only are your current business needs met, but also that the chosen payments solution provides your desired flexibility and can scale up for future growth. Because we think of clients as our business partners. We’d like to be yours.